Siracusa is an attractive holiday destination in Sicily, with a good choice of places to stay. Aretusa Vacanze, in Siracusa on the island of Ortigia, is a residence-type B&B offering rooms which are like mini-apartments, along with breakfast and daily cleaning. There is a choice of apartment types, with varying sizes and prices. I stayed at the B&B with my parents in April 2011 for four nights. I had booked a 'two-bedrooom' apartment online, three months in advance. 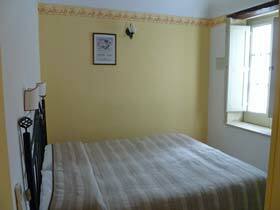 At €125 per night, it was a reasonably economic option compared with other accommodation in Siracusa. 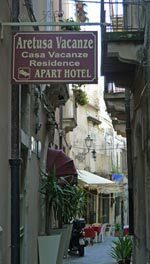 Travelling in Sicily by public transport, we arrived in Ortigia using the town's free little shuttle bus, and walked to the 'apart-hotel' from Piazza Archimede, following an easy route I'd looked up on a map in advance. Armed with this map, it was easy to find Aretusa Vacanze. Alternate circuits of the shuttle bus actually stop much nearer the B&B, at the Fonte Aretusa. We were greeted warmly and sent up to our apartment in the B&B's eccentric little lift, while the receptionist ran up the stairs to meet us and show us the rooms. Our flat consisted of two rooms and a bathroom. The door opened into the larger room, which comprised a living area with a kitchenette and a sleeping area partially shielded by a small folding screen. The bathroom and the second bedroom were entered off this main room, so sleepers in the second room had to walk via the first room to use the bathroom. We would have preferred to have two private bedrooms as well as separate living space, but in other respects the accommodation was quite comfortable. The large bedroom/living area was furnished with a double bed, desk, hard chairs, a large flatscreen TV, a wardrobe, air-conditioning, two bedside shelves, a mirror and the folding screen dividing the bed from the cooking area and the bathroom door. There was a window/door out onto a little balcony (with a lockable gate), looking over the narrow alley outside and the sadly abandoned building opposite. The kitchen facilities included a fridge, hobs, a kettle, crockery, cutlery and cooking equipment. There were wine glasses, should you wish to bring back a bottle of local red Nero d'Avola wine. The provision of a kettle and other equipment (including cleaning cloths and liquid) was better than I generally expect from this type of accommodation in Italy. A selection of teas was provided (and replenished), and other snacks and drinks were offered at mini-bar prices. On our first day a little welcome gift of miniature almond pastries was in the room. The tapwater, like public taps we tried, tasted odd and rather saline but this is evidently a feature of Siracusa's water supply and not to do with the B&B. A small grocery store down Via Capodieci was a useful place to stock up on cheap bottled water and other provisions. The apartment's most unusual feature was a laptop computer for guests' use, connected to the internet. This was a very helpful and thoughtful gesture. Wi-fi connection was also free when I wanted to use my own computer. The second bedroom was small, with a double bed but little room for other furniture or for suitcases. It had a bedside shelf at one side of the bed, a wardrobe, and a window looking out over the lane. It was really no more than a place to sleep, while using the main bedroom as a living area. Our bathroom was accessed from the living area/main bedroom. It was quite small, but decent, with a shower, washbasin, toilet, lots of towels, a hairdrier, toiletries, and wicker drawers for storage. Our rooms were cleaned daily, and fresh toiletries, spare loo roll etc was replenished carefully. The B&B didn't have much public space. The reception area was a small lobby at the end of a corridor, and rooms were accessed by a small and rather sensitive lift (we had to keep our fingers on the button to keep the lift in motion). Without the lift, it was two flights of stairs to our room. Small spaces such as window ledges were used to store books and leaflets for guests - another nice touch. 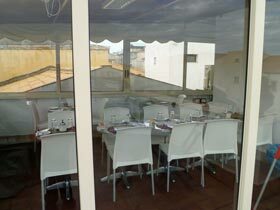 The hotel has a roof terrace, partly covered and used for breakfast, which provided some space for sitting and looking over the rooftops. This was reached by a narrow spiral staircase by our room, which did mean quite a bit of noise in the mornings and when guests clomped up and down for cigarette breaks. Breakfast was provided on the B&B's small roof terrace, which was partly under cover, though we did manage to sit outdoors on one, sunny morning. The space available was really a bit too small, and tables were crowded, while guests occasionally had to wait a few moments. Breakfast was a buffet, with waiters to provide hot drinks, clear tables, and replenish the food. The buffet was reasonable, with yoghurts, fresh oranges, cereals, fresh croissants, cake (on two mornings of our stay it was a delicious apple cake), rolls, fruit juices (watery), mini frankfurters, cold ham, cheese slices and warm hardboiled eggs. The Aretusa Vacanze reception staff mostly spoke English and were very friendly and helpful, especially the gentleman on duty in the evening, who was jovial and full of advice, making good restaurant recommendations and even escorting us to the restaurant next door. The staff seemed genuinely interested in how our trip was going and keen that we should enjoy their city. I noted that even the cleaners were cheerful and friendly, with some English. On the day of our departure, it was raining and the Aretusa Vacanze receptionist consulted online bus timetables for us and, since the times weren't convenient, organised a taxi for Catania airport for a set price of €60 (the taxi was large, prompt, comfortable and saved us a lot of travel hassle; the journey took an hour). 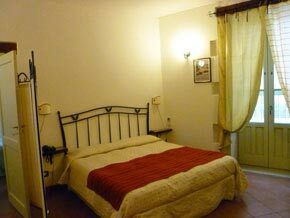 The B&B is located on a little alley called Vicolo Zuccalà, which is just off Via Capodieci and close to the Fonte Aretusa. This is up towards the tip of the island of Ortigia, and is a really convenient place for wandering around the seafront and the little historic lanes. A popular restaurant is just down the alley (there was a little night-time noise from people outside, but it died down; we ate there ourselves one evening.) Aretusa Vacanze is easy to reach using the little free shuttle bus (navetta) from the mainland bus terminal and railway station. One of the two navetta routes tours the whole shore of the island - get off at the Fonte Aretusa, walk a short way up Via Capodieci and you'll find the B&B just down the alley on your right, next to La Foglia restaurant, indicated by a sign. On the alternative bus route, alight at Piazza Archimede, walk down Via Roma, then turn right onto Via Capodieci. I suppose the only drawback with the location was that being at the far end of the island meant a longer walk to the mainland sights - however, the navetta provided a convenient alternative to walking. Ortigia is a difficult destination if you are driving - the B&B does offer help with parking, but I'd recommend asking their advice in advance. I thought that Aretusa Vacanze was a very convenient and practical place to stay. Our apartment wasn't luxurious - the smaller room didn't have hotel-standard facilities or space - but it was decently furnished and decorated. Having kitchen facilities gave us the option of cooking and saving money on restaurants. The two-room flat would be very useful for a family, though adults travelling together might want to consider the space/privacy elements of the layout. A lot of thought had gone into making guests comfortable, and the little details and extras - like the laptop - were impressive. The staff were a great asset to the B&B with their friendliness and helpfulness. For independence, economy, convenience and good service, I would highly recommend Aretusa Vacanze as a place to stay in Siracusa.